Wearing a saree, especially for non-festive occasions, is such an eyebrow-raiser these days. Me thinks that is not just beauty, but even disapproval that lies in the eye of the beholder. Behenji, amma, aunty, mataji, teacherji, or madam are some of the sarcastic terms of endearment that are likely to come your way when you wear a saree. And if you happen to be approaching the hill (35+ years), sporting some middle-age spread, wearing a saree can invite a stray and tactless comment by the self-appointed fashion and trend police. This unfortunate behenji-fication of the saree does not deter me from wearing one when I want to. Someone who loves sarees once told me “Sarees have stayed in ‘fashion’ for 2000 years. They’re not going anywhere.” And I so second that sentiment. On this happy, optimistic note I bring to you, from the state of West Bengal, a handloom delight. F for Fuila. And no, I am not tryin’ to fool ya’. There really is a saree by this name. Though some may call it Phulia, I prefer the ‘F’ over the ‘Ph’. See I have a duty toward this alphabetical list I am trying to keep alive and without the Fulia, the F would be without a match. The Fulia saree is hand-woven using cotton or silk yarn – simple and with little embellishment. The idea behind the Fulia is to let the fine fabric, the weave and the texture speak, hence the minimalistic style. A border, a few stripes or a smattering of a block print is all you get to see on a Fulia saree. Although I have seen the Fulia saree many times, I don’t own it, neither have I worn one. From what I have seen I can say that my wardrobe could definitely make space for one silk and one cotton Fulia saree. A Fulia saree is a fine example of the illustrious Bengal hand-woven saree heritage. This saree is named after the town Fulia, in the district of Nadia 90 kilometers from Kolkatta. The weaving heritage of Fulia is not very old. The weavers in Fulia trace their lineage back to the weavers of the famous Dhakai Jamdani of Bangladesh who settled in India at the time of partition. Some of them settled in the already rich weaving centers of Shantipur while most others settled in Fulia. A whole lot of information about Fulia and its weaving history abounds on the Web, but very little is written about the features of the Fulia saree itself. Some of the most informative sources I recommend for further reading are this blog and this website. How does one recognize a Fulia saree? Well, I tried hard to look for answers and found it difficult to find a concrete one. Based on what I know of these sarees by observation, I can say that these sarees do not carry Jamdani-like motifs. Their texture is coarse to look at but very fine, soft to touch because of the hand-woven characteristic. They are usually plain and available in earthy colours. 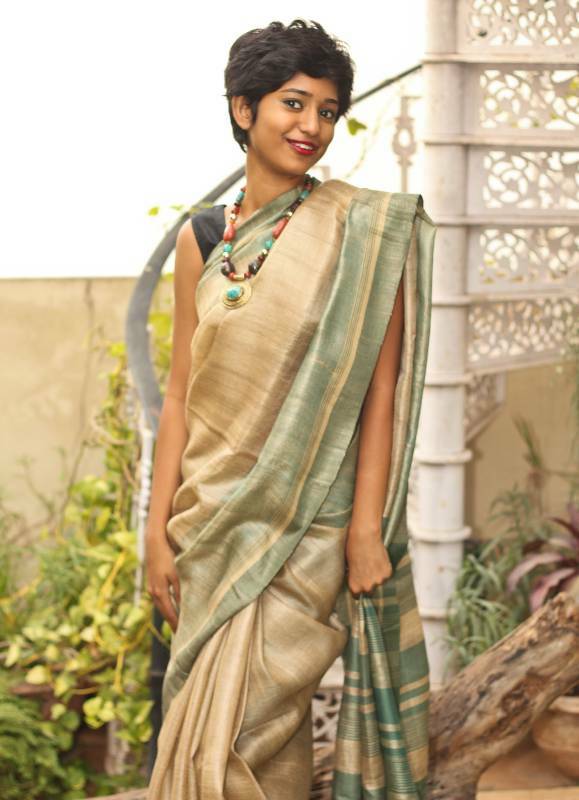 They do however, look a lot like any other hand-woven cotton saree. A cotton Fulia may cost anything between rupees 1500 to 3000, whereas a silk saree may cost above rupees 6000. A Cotton Fulia saree with block-print pallu. For the lovely images in this post, I am most grateful to www.jaypore.com who almost immediately gave me the go-ahead to use their images. It was a plain, creamy-beige silk, with bright red woven triangles in the border and larger triangles of the same colour in the pallu. The fabric seemed a little coarse, but was surprisingly smooth to the touch. “How much does this Tussar cost”? I recall asking the sales lady, in a saree shop in Chennai, one wintry morning (whatever that is). “Madam this is Assamese Gheecha – not Tussar” she said, with a smirk I think. What is an Assamese Gheecha? I had never heard of this saree before. I wanted to know more. “Both are completely different Madam” the sales lady had looked at me with disdain and ticked me off. Of course, I said with a smile. And no, I did not want to look silly in front of her one more time. Best to be quiet now I thought. And best not to be taken for a ride too. Since this Gheecha silk looked so much like Tussar. I was curious about this Assamese Gheecha and excited at having discovered one more type of saree. By now, I was not just greedy for sarees but also for the story that came with each type. And the accompanying science, history and geography were also welcome. Gheecha silk, a friend informed me, was not named after a town (like Kanchipuram) or a weave (like Ikat). It was a type of silk. Just like Matka, Tussar, Mulberry, Jacquard and Raw Silk and many others. Deep love cannot last without deep understanding. So besides making sense of types of sarees, I realized that I must also understand these myriad forms of silk to help me build an authentic collection of sarees. For most of us, the first lesson in silk happened in school. A silkworm eats leaves and cocoons itself. The filament of this cocoon is reeled out and made into silk. In my later lessons I learned that the type of silk depends on 4 things: the species of silkworm, the tree whose leaves it eats, how its cocoon is processed into yarn and finally the technique by which the yarn is woven into a saree. Let’s take Mulberry Silk for example – the finest silk available in India. When a silkworm called the Bombyx Mori eats the leaves of Mulberry tree you get a cocoon that ultimately gives you Mulberry Silk a thick and lustrous, expensive silk. The filament of the cocoon is ‘unreeled’ as a single thread, without breakages – giving Mulberry silk its lustre and strength. A Mulberry silk feels satiny smooth, luxurious to touch and strong. It can be thick – like in a Banarasi saree or thin and sheer like in a chiffon. Read more about the legend of how Mulberry Silk was discovered. The wasteful remains of the Mulberry cocoon filament – gives Matka silk. The name ‘Matka’ or clay pot refers to the vessel where this waste is stored after removing the filaments for the Mulberry silk. It is thinner, not as lustrous, but still feels like silk. It is usually much less expensive. And get a load on Tussar. It is born from the cocoons of moth worms that feed on the leaves of Juniper and Oak trees. The moth pushes itself out of the cocoon thus breaking the continuity of the filament. Hence the resulting filaments are short and coarse. This is why Tussar silk, though looks very good, is rough to touch. This silk does not bond too well with dyes. Hence most Tussar sarees are beige, their natural silk color. They do however, hold prints very well, hence printed Tussars look good and are popular. Read more about different types of silks to update your knowledge about it. And now coming back to the love interest of this episode, the Gheecha silk. It is obtained when a certain species of worms, found only in Assam, feed on the Eri tree. Eri, originally is ‘Eranda’ – the Sanskrit name for Castor (from where we get Castor Oil. Yes, that god-awful stuff that we as kids were made to drink sometimes for bad tummies.) So even though the Gheecha silk looks a lot like Tussar, its texture is smoother, softer, due to the filament that comes from the completely domesticated Eri worm. A model wearing a beautiful Assamese Gheecha saree. It has been 10 years since I first saw this north-eastern jewel in the heart of South. I did not buy that saree at that time as I did not know enough about it. Meanwhile I continued looking for it in Government sponsored handicraft fairs and emporiums. I still have not found one that I like or one that convinced me that it was not a Tussar palm-off. So wait I will. For the next convincing smirk. Sources: For reference: http://mytextilenotes.blogspot.in/2009/05/some-online-resources-in-silk.html and the URLs mentioned in the write-up. For inspiration: Several cups of Assam Tea. With milk on the side. Not kidding!